The prices are hard to beat. And the salsa here rivals most all "homemade" versions at stand alone restaurants. 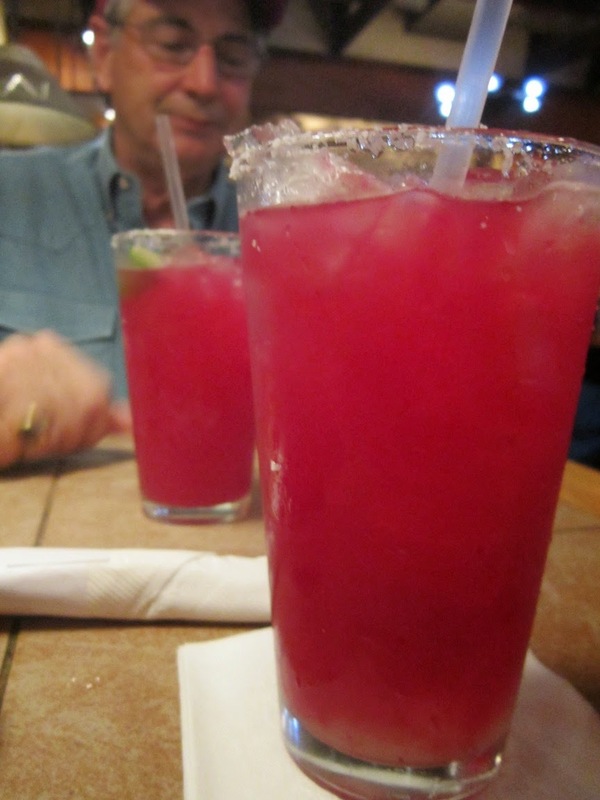 While Cowboy Ron and I were in Fort Worth we saw Cactus Margaritas on the menu and decided to give it a try. Sweetened with agave and prickly pear juice this was a sugar bomb! I found myself diluting it with water and it helped. If it just lacked so much sweetness and cut with a lemon lime soda it would have been awesome! I would do backflips for the BBQ Jalapeno Salmon. I always ask for them to serve refried beans and rice rather than the vegetables and black beans that normally come with the meal. The jalapenos are kickin' and the perfectly sauced salmon is my ideal way to spend a meal on the road. Cowboy Ron tried the trio of Enchiladas and they represented all the colors of the Mexican flag. He happily enjoyed his meals, as he always does, with a smile on his face. He makes for a delightful dining companion staying positive on his meal and workings of every restaurant. So it is a chain restaurant, it is on the higher end of the franchise spectrum. You are usually greeted by the friendly service, tasty food and a fair bill. I recommend you give it a try when you are forced to pick between "other" Mexican restaurants.